Hope you had a great week. Weekend is almost here and we’re off to a short trip. Just wanted to quickly share with you this new monthly calendar that was launched today. 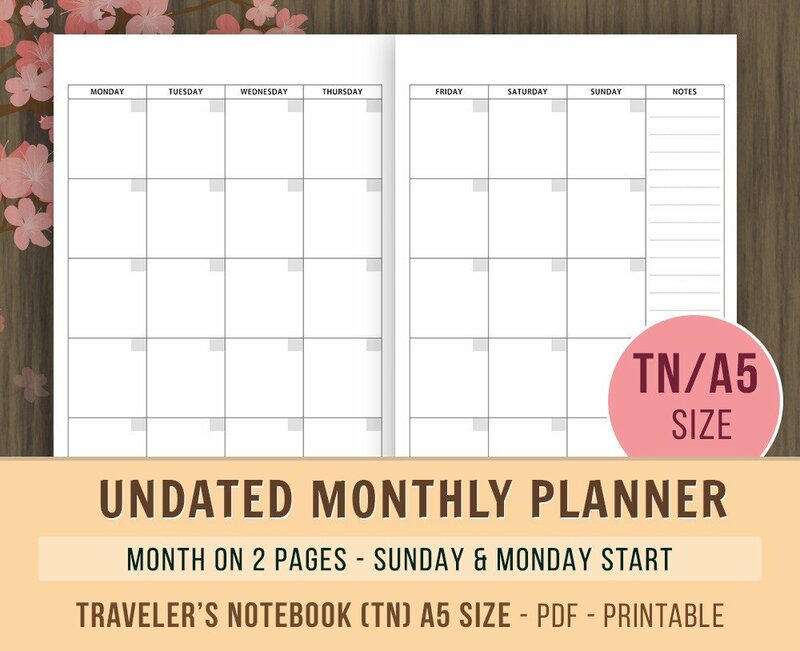 Traveler’s Notebook A5 size monthly planner – undated calendar! There are two versions: Sunday Start and Monday Start. Since these are A5 size, these will print on A4 size paper. Besides Sunday and Monday Start, there are two different versions of this undated monthly calendar. One comes with 2 pages, month spread on 2 pages. Other pdf comes with total of 28 pages. There’s a cover page, two notes page, then months spread on 2 pages. There are total of 24 pages for the months, then notes page and last page. I’m not really sure which version our users will be using more of. The one with 2 pages or the one with 28 pages. It would be great if you can share which one you find more useful. The version that comes with 28 pages will be printed in Booklet mode. This means that in order to print back to back, you will need to make sure the settings on your printer dialog box are correct. Once you set up your printer settings, simply print the pages and keep them in the same order as they printed. Fold them in the half. That’s all. Once you fold them, you will see them sitting in the right order. Please feel free to share how you like these.